Ask a pianist if they’ve ever heard of a Williams brand piano, and they might tell you no. For a few years now, this brand has been slowly carving out a niche for themselves without much fanfare due to multiple distribution deals with Guitar Center, Musicians Friend and more. Despite this, Williams has been able to build up a sort of grassroots loyalty base with their products, most notably due to their affordability. I’ve found their products to be at times lacking in several key areas, but overall, the quality oftentimes does match the price you will pay, especially for the Rhapsody 2 product line. The Williams Rhapsody line of weighted key digital pianos is the newest addition to the brands full lineup, consisting also of the Williams Allegro and Williams Overture models, as well as the higher-end Symphony. These products’ primary value proposition over their competitors is the lower price they carry, often due to the exclusivity of the brand with the dealers you’ll find carrying it. In the case of the Rhapsody 2 model, I was fairly surprised at the quality of the construction. 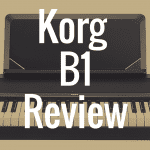 I went into this review thinking that an electric piano at this price range styled as a classic upright would have to feel extremely cheap and fragile, but the truth turned out to be a bit different. The black finish on the wood looks nice, and the size and weight of the piano makes it fairly simple to get set up in a tight space. It seems like this piano would actually make quite a good decoration, if that was what you were after. There is a music rest that sits atop the piano, which seems sturdy and easy to reach when needed; always a welcome addition to a product like this. Below the keybed, there sits a two pedal damper system. It would have been very nice to see the traditional three pedal setup included, but I suppose that’s what you get as a tradeoff. It’s better than nothing! The interface on the Rhapsody is simplistic, almost to a fault, but to be honest, it is probably what is needed at this level. It’s straightforward and easy enough not to overwhelm even the most novice player, which I suppose is the intended effect. Still, even for the price range, I would have liked to see a bit more customization and depth to the menu system. 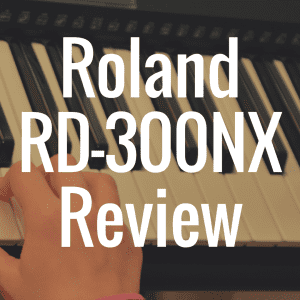 Everyone knows that the sound quality of an electric piano will make or break the experience for most users, and it is here that the Rhapsody 2 really falls short in my opinion. For being billed as an electric piano, I simply did not find any of the 12 different presets to be particularly authentic-sounding. Most damning of all was the grand piano tone, which I felt was incredibly bright and not very reminiscent of an actual grand piano. Many might write this off in the name of affordability, but I say this, especially to beginners: being able to understand the tonal characteristics of a piano and getting an accurate feel for what a proper keybed feels like when playing is crucial to developing the right technique, and I feel that after playing the Rhapsody 2, the weighted keys themselves feel nice enough, but there wasn’t enough velocity sensitivity to feel natural. For a product billing itself chiefly as a digital piano, I think that this is something that warrants the attention of a potential buyer. Aside from the Grand Piano patch, there are 2 Electric Piano options, two Organ options, some Strings, a Bright Piano, a Bass, Harpsichord, and finally, a Choir. A few of these sounds, such as the harpsichord, I did actually find to be quality enough, but again, that isn’t the focus of the Rhapsody line and it certainly isn’t enough to make me confident in the product as a whole. The sounds aside, one feature I did appreciate was a demo button for each of the 12 sounds; with a press, you can hear the sound played back to you, giving beginners a nice crash-course on how best to use the sound to the fullest. These songs are well recorded, and I’ve written in the past about my admiration for this feature in higher-end products. It is important to note here that I do realize that not every piano player is looking for a top-of-the-line, advanced electric piano. I know that some players are simply looking for an affordable, easy-to-setup and use system, and I am fully aware that the Rhapsody 2 might suit these individuals just fine. With that said, I do feel that my critiques are fair points for all piano players, regardless of skill level, needs or requirements. There are several features built into the Rhapsody 2 that I did in fact enjoy. 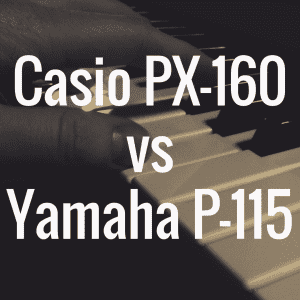 There is a built-in metronome, which is a basic feature that should be included in every electric piano, but nonetheless, its inclusion is certainly welcomed here. You can adjust the tempo to suit your desires, or the song you are currently working on, and the interface for doing so is simplistic and functional. There is also the ability to split the keyboard itself into 2 different zones, each one playing a different sound. It would have been nice to see 4, or maybe even more zones instead of just dividing the keyboard evenly, but honestly this was an unexpected feature and It certainly is better than nothing. Additionally, you can also layer two sounds together if you so desire, and I found that the sounds almost sound better together than they do on their own. Finally, there is a two-track recorder built into the keyboard, allowing you to record short phrases for playback later on. This can be very handy when composing, or just wanting to get a quick idea down so it isn’t forgotten. There is a MIDI connection on the piano, allowing you to hook the Rhapsody 2 up to use with your DAW of choice, which is another feature that was a pleasant surprise. I found that using Logic Pro X, the piano was recognized instantly and didn’t need any additional configuring to function correctly. The Rhapsody 2 is one of a few different products that Williams currently makes, rounding out the list alongside the Allegro, Legato, and the Overture (and technically the Symphony, although this is a digital grand). The original Rhapsody is also still available, with a number of notable differences separating it from this second edition of the piano. To make things a bit easier to digest, let’s directly compare the Williams Rhapsody to a few of the other digital pianos made by Williams Pianos. The Allegro is a different kind of product altogether. Representing the extreme end of Williams’ low-end budget line, the Allegro eschews the upright design for a portable keyboard setup while keeping several of the features that make up the Rhapsody 2. Ten custom sounds are included, and in an interesting move, the Allegro 2 keeps the hammer action keys found on its larger cousins. If you aren’t looking for a classical setup in an upright fashion, this actually might be a fantastic piano for the price. 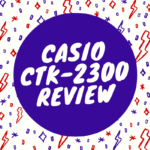 The quality is certainly better than many of the portable keyboards in the sub-$300 price range, and for that reason alone, it’s an impressive feat. I see this as the perfect quality first keyboard for a beginner taking their first steps into learning the piano. The Overture 2 represents William’s higher range full sized piano, sporting 3 full pedals and a more classical noir finish. There are 4 sensitivity levels instead of the 3 on the Rhapsody, giving it a leg up in playing feel. There are also 128 different sounds loaded into the piano itself, up from the 12 on the Rhapsody. Several other features get a boost as well, such as 46 additional preset songs, the addition of a pitch bend, AUX IN, and more. Overall, the Overture 2 is quite an impressive piano. The stock sounds are largely the same, but with so many options to choose from, there really is quite a bit of adaptability here. If all you’re looking for is a classy practice piano for the living room, the Rhapsody 2 will honestly be your best bet for the money. The $200 price difference might warrant the additional features, but only if you find value in having them. For most, I’d venture to say the Rhapsody will do. The Rhapsody 2 shares most if not all of the key elements on the original design, which can now be found for even cheaper online and in secondhand stores. Just how different are they, though? Well, the only notable difference between the two lies in the body of the instruments themselves. 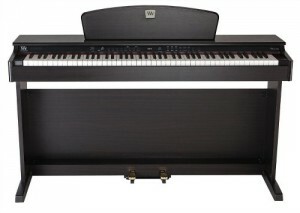 The Rhapsody 2 features a PVC, wood-like finish that is darker overall than the off-black material used in the original. In my opinion, this definitely takes things up a notch in the aesthetics department, and even though you can indeed find the original for a bit cheaper if you look hard enough, I’d say that for anyone who cares even a bit about looks, it’d be best to opt for the 2nd generation product. The Williams Rhapsody 2 really is a sound product for the price being asked of it. 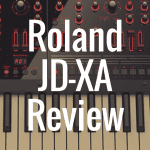 Although it falls short of my expectations on the sound design and functionality front, it combines a hyper-affordable piano with a design that is easy on the eyes, which is honestly right on the money for the demographic this is intended for. Many reviewers have agreed that the combination of quality and competitive pricing works very well here. Overall, I’d say you’d have to look pretty hard to find a better value at this level, and to their credit, Williams could have skimped out much more in several areas and gotten away with it. The Williams Rhapsody 2 isn’t the best digital piano ever created. 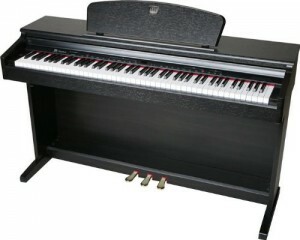 It is, however a straight-shooting piano that delivers a great looking product that performs well against the competition. That said, there’s definitely room for improvement in the sound design category, which for a product like this, can be a pretty unforgiving fault. 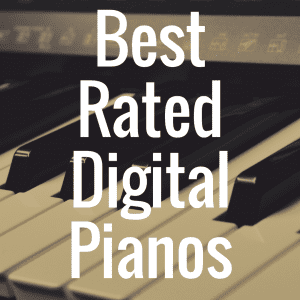 Ultimately, if all you are looking for is an excellent looking piano that plays well and serves its function, you won’t be disappointed with the Rhapsody 2.